We have a winner in our Dog Days by Elsa Watson book giveaway! Cstironkat (Kelly Ann T) was the lucky participant chosen by Rafflecopter. Kelly will need to contact me (sue at forloveofadog.com ) with her shipping address within 48 hours. If we don't hear from her within that time frame, an alternate winner will be chosen. 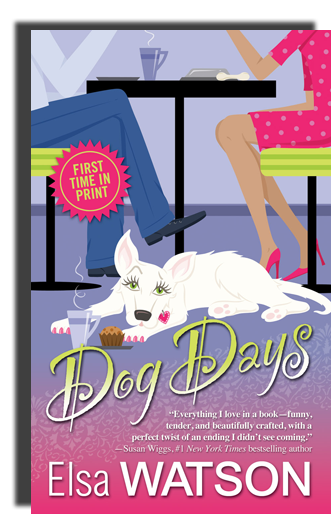 I loved Elsa Watson's The Love Dog, so feel pretty sure Kelly is going to enjoy Dog Days! I want to give a shout out to everyone who participated in this giveaway - Thank You! What the Dog Ate by Jackie Bouchard was recommended by Danielle. Like many of you, my own favorite dog book changes the more I read. One of my all-time favorites is The Dogs Who Found Me by Ken Foster. And I'm really looking forward to the, as yet untitled and unwritten, book by Jodi at Heart Like a Dog blog! All great books. Thanks for sharing them. I've actually got one I am reading now that I hope to share soon. Congrats to the winner! I'll go ahead two of my favorites to your list..."A Dog's Purpose" and the followup "A Dog's Journey" both by W. Bruce Cameron...I thought about my dogs a bit differently after reading them. I'm so touched that Danielle mentioned my book! I also love anything by James Herriot and loved Peggy's book. I see there are some more books here that I need to add to my "to read" pile! One of my faves was "Amazing Gracie" by Dan Dye. It's the story of a blind great Dane that was the inspiration for 3 Dog Bakery. Such a sweet and well-written book!